If you haven't heard of either WeChat or Chatime, one advise, GET YO'SELF TOGETHER GIRRRRLLL. But just to briefly go through what they both are, WeChat is a mobile social communications app for smartphone users, in an urban term: Chat Apps. It is the most downloaded mobile social app in many markets and best of all it's free. And for what I know is that a lot of my friends are meeting new friends using WeChat, well personally I'm not a big fan of doing so because I'm afraid of being catfished, but just plainly using the app to chat with your good friends is very entertaining as it is with all their cool in-app features. Chatime is, well I'm pretty sure you all know and have seen their purple signboard around everywhere, a very popular and loved lifestyle tea brand which was introduced only 3 years ago in Malaysia. In such a short period of time, they've managed to take our hearts away with their hand-made beverages and fresh-brewed tea prepared on site by their trained tearistas across 105 outlets nationwide. My personal Chatime favourite is Yakult Green Tea and Passionfruit QQ! 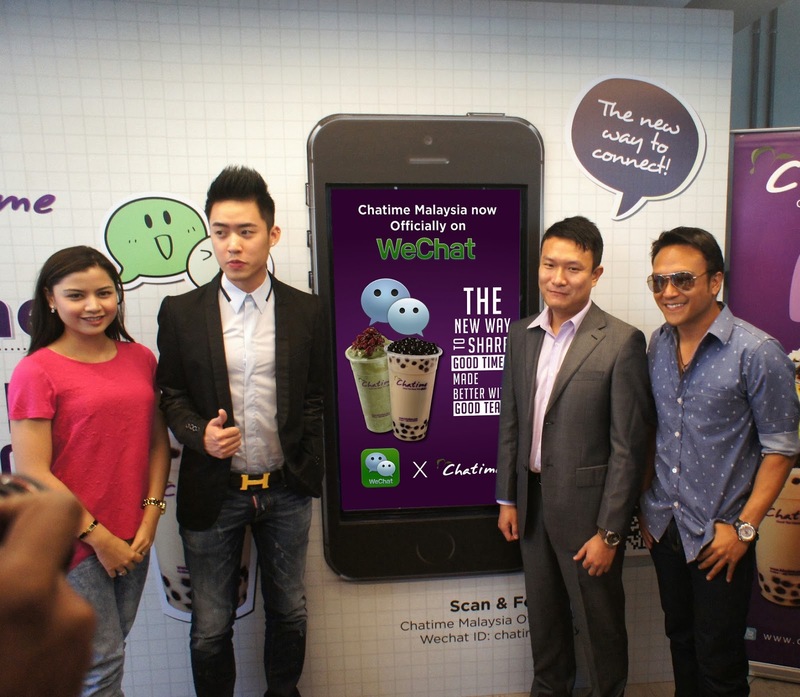 WeChat has announced their partnership with Chatime on Friday (18th), at Chatime Malaysia HQ in Kota Damansara, to officially launch their series of roadshows and special promo for the customers. Lisa Surihani and Shaheizy Sam, making special appearance as ambassadors, posing alongside with Bryan Loo, managing director of Chatime Malaysia, and Louis Song, country manager of Singapore and Malaysia for International Business Group at Tencent, the company behind WeChat. 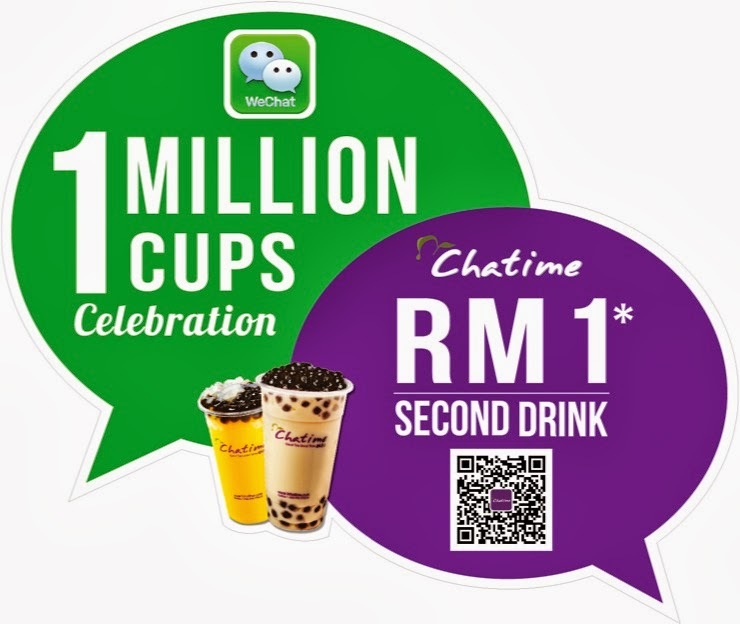 And good news for all us, this collaboration introduced a special promo for all WeChat users, called "Buy 1st Cup, 2nd Cup RM1". The mechanism is fairly simple and it doesn't cost a single dime to enjoy this offer. 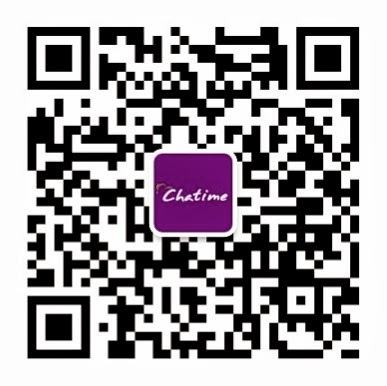 All you have to do is follow Chatime Malaysia's official WeChat account (ID: Chatime Malaysia; or simply scan the QR code below) and redeem your phone voucher by flashing it at any participating Chatime outlet. If you don't have WeChat, well what are you waiting for? Download it from your smartphone app market and start following, it's free and you have absolutely nothing to lose! Also, the WeChatime collab is carrying out a series of roadshows with lots of interactive games, lucky draws and many other exciting stuff at the selected dates and outlets as below. So head on over and flash your "Buy 1st Cup, 2nd Cup RM1" phone voucher and stand to win exciting prizes! Now that you've got all the deets, hurry up and get your Chatime fix before it ends on the 27th of October!